How can I import a DEM or GRD into Voxler at the right Z-Level? A DEM or GRD can be imported as a curvilinear lattice; which will import using the correct Z –Level coordinates and locate at the correct Z-level. In the Import dialog, navigate to the DEM and click Open. 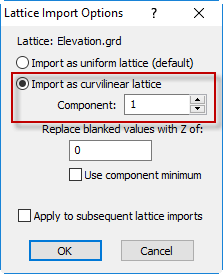 In the Lattice Import Options dialog, click Import as curvilinear lattice and click OK.